If you’re in the Woonsocket, RI, area today through Sunday, you might want to check out a new vampire musical debuting tonight at St. Ann’s Arts & Cultural Center. 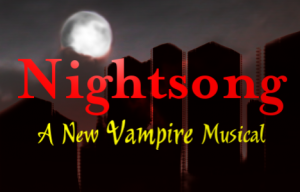 With music written by Kari Tieger & Kevin Campbell, based on Tieger’s 1996 EP release, “Trilogy of Nightsongs: A Romantic View of Vampires,” Nightsong: A New Vampire Musical tells the story of Robert, a 300-year old vampire who’s been feeling a little off lately. His eternal lover, Vivienne, “has grown increasingly cold over the years” and she views humans as little more than a source of sustenance … unlike Robert, who still finds them fascinating. But low and behold, a new conquest has caught Robert’s eye: Andrea, a naÃƒÂ¯ve human who’s been widowed for nearly two years. Robert becomes desperate to be closer to her without pursuing her physically. So he calls upon an ancient, forbidden power, known as the Nightsong, to enter Andrea’s dreams while she sleeps, drawing her fragile mind ever closer to him.